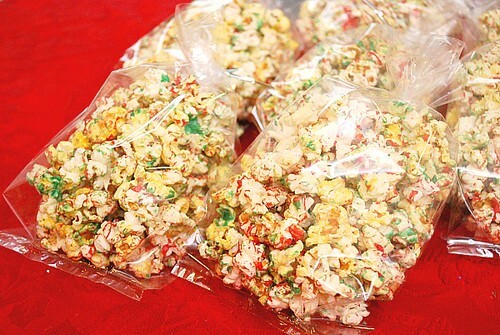 Mircowave popcorn, red chocolate melts and green chocolate melts. That's all you need to make Christmas Corn. Essentially, it's popcorn drizzled with melted colored chocolate, tossed and allowed to set. The combo of salty and sweet is key and this festive snack is addictive. But why stop there? You can make 'Hanukkah Corn' with white and blue chocolate melts. Maybe try red and pink chocolate melts for 'Hugs & Kisses Corn' in honor of Valentine's Day. You get the idea. Enjoy... and thank you Megan! Prepare the popcorn as directed. You can also use store bought popcorn or popcorn prepared however you like. Transfer your popped corn onto a large roasting pan and set aside. Using a fork, dip the fork into the red melted chocolate and drizzle the chocolate over the popcorn. Repeat with another fork into the green melted chocolate. Toss the popcorn gingerly to coat and repeat drizzling the chocolate as desired. This looks great creation!will definitely add extra enjoyment for this festive occasion! any ways merry Christmas and a prosperous happy new year.